In the build-up to the Grand National each year there are several key races that are often used by potential runners in the big race – one of which is the BECHER CHASE. Run at Aintree racecourse and being that it’s over 3 miles 1 furlong of the Grand National course – including the unique fences – then it’s easy to see why so many trainers pin-point the Becher Chase Aintree for their Grand National runners. 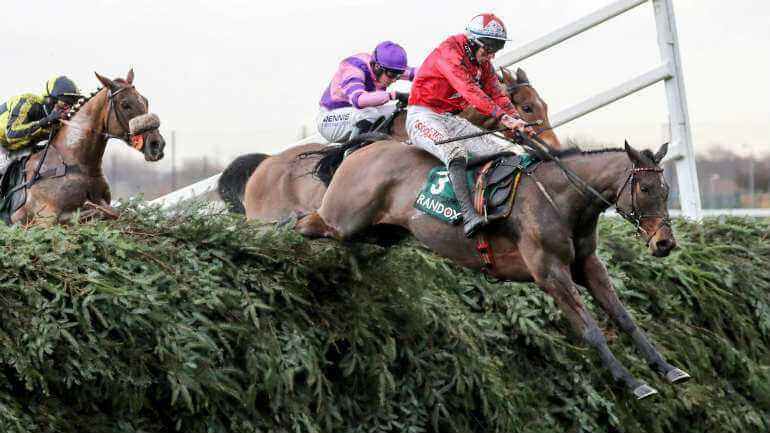 Yes, in the Grand National the final runners will have around another mile to travel, but gaining valuable experience of the tricky Grand National-style fences is a big asset for horses to have. With that in mind and with the 2017 Becher Chase having already been run then to help we’ve listed the full finishing positions of the 15 runners below – let’s see how they get on in the 2018 Grand National. He was fourth in the 2017 Grand National, but the Nigel Twiston-Davies-trained BLAKLION managed to go three places better in the Becher Chase Aintree on December 9, 2017. This 8 year-old – who don’t forget will be 9 by the time the 2018 Grand National is run (every race horse has it’s birthday on the 1st of Jan) – was sent off the 7/4 favourite for the Becher Chase and after the race it was easy to see why. Having valuable experience of these fences in the past and the fact we know he stays further than the 3m1f Becher Chase Aintree trip were huge plusses ahead of his chance. It really was a case of just getting round and jumping the tricky fences in order to reward favourite backers. The popular The Last Samuri chased him home to complete the course for a fourth time and looks a live outsider with Grand National betting odds of around 25/1 (odds are subject to change), but with age still on his side and another year on his back the improving Blaklion is sure to be popular for the Grand National again as he bids to improve on his fourth in the race 12 months ago. Bookmakers reacted by shortening his Grand National betting odd into around 12/1 after his easy Becher Chase victory. Don’t forget to check back to the full finishing order of the 2017 Becher Chase (below) when the final 2018 Grand National runners come out, while – as it was backed-up last year with One For Arthur – there is no harm looking further down the finishers. Do Winners Of The Becher Chase Go Onto Win The Grand National? The quick answer is – yes and no! In terms of winners from the same season going onto win tthe Grand National, the record isn’t great. Running another Merseyside Marathon four months later is a big ask. In fact – the last 15 winners of the Becher Chase have failed to win the Grand National that same season. But it is worth pointing out not all 15 tried. However, Becher Chase winners do have a fair record of winning the Grand National later on in their careers. Silver Birch and Amberleigh House two examples if this. Silver Birch won the Becher Chase in 2004 and then went onto land the Grand National in 2007, while Amberleigh House did the double in 2001 and 2004. This may suggest that a slightly younger horse is more equipped to win the Becher Chase. But when it comes to stepping up to 4m+ for the Grand National, it might take a few years to strengthen up. Further backed-up with 9 of the last 15 Becher Chase winners going onto finish unplaced in that season’s Grand National. It doesn’t necessarily have to be the winner. 12 months ago, 2017 Grand National winner – ONE FOR ARTHUR – came fifth in the Becher Chase four months earlier. The Lucinda Russell-trained 8 year-old was only beaten 3 lengths by Vieux De Lion in the 2016 Becher Chase. However, over the longer Grand National trip, he managed to reverse the form with the Becher Chase winner with Vieux De Lion in 6th. 2017 WINNER: BLAKLION (7/4 fav), Jockey: Gavin Sheehan, Trainer: Nigel Twiston-Davies. Trainer Nigel Twiston-Davies has won the race 6 times since 1993.